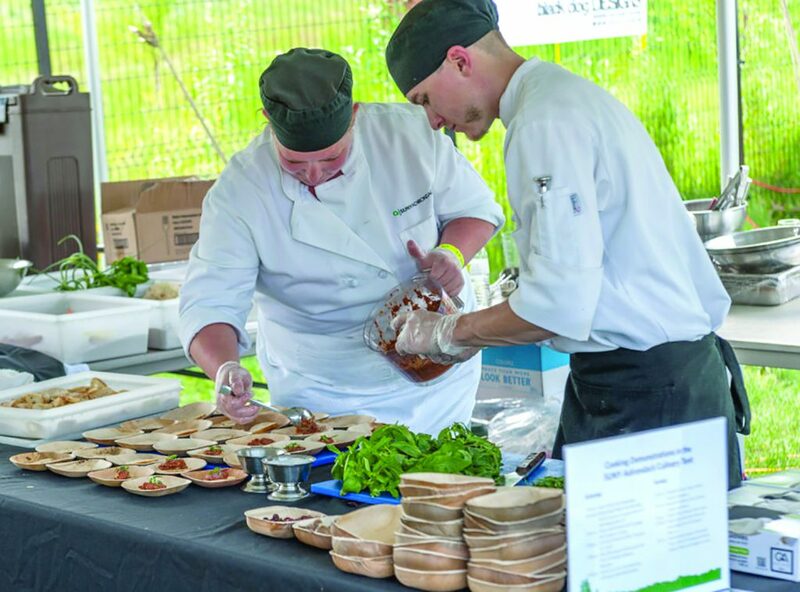 SUNY Adirondack culinary students prepare food at last year’s Adirondack Wine & Food Festival. Students from the college will again be part of the event on June 24-25 in Lake George. Adirondack Festivals LLC has a long list of vendors slated for this year’s Adirondack Wine & Food Festival set for June 24-25 at Charles R. Wood Festival Commons in Lake George Village. “This festival celebrates the bounty of amazing craft beverages and locally made foods that New York has to offer and we’re excited to report that we will have more vendors and variety than ever before,” said Sasha Pardy, co-owner and president of the festival’s presenting sponsor, Adirondack Winery of Lake George. The vendor list includes 23 wineries, eight distilleries, four breweries, three cideries, 23 artisan food vendors, six specialty vendors, eight food trucks, one local restaurant and a weekend full of culinary demonstrations provided by the SUNY Adirondack culinary students, she said. “Where else can you discover your new favorite locally made wine, beer, vodka, cider, cheese, salsa, olive oil, garlic sauce, hot pepper jelly, kettle corn or ice cream all in one place? Attendees also love that our food trucks offer a variety of cuisine from classic barbecue and gourmet burgers to empanadas and gyros,” said Pardy. Festival tasting-ticket holders receive a souvenir festival logo wine glass at entry to use to sample from the hundreds of craft beverages and artisan foods vendors will be offering. Attendees also receive a complementary welcome bag and festival program and tasting guide to navigate their way through the festival and take notes on the products they’ve sampled. To encourage support of these local producers, the Adirondack Wine & Food Festival offers a “purchase drop-off and pick-up tent”, where attendees can drop off the purchases they make throughout the day for storage. The packages can then be picked up as they leave the festival. “So far, this year, we have already sold more than 1,000 tickets and the bulk of our marketing campaign is just kicking off now. We will see ticket sales really take off from this point. I’m confident that with great weather, we will hit our 6,000 attendee goal,” said Pardy. “While nearly all attendees reported in our 2016 post-fest survey they would attend again, we’re always looking at ways to improve attendees’ experience,” said Stephanie Howard, festival coordinator. “The Adirondack Wine & Food Festival draws an important and new demographic to Lake George,” said Pardy, citing statistics of ticket buyers and their 2016 wrap-up attendee survey. “This event attracts people from near and far and draws a much younger visitor than existing large Lake George events. Additionally, our attendees are weighted to females and statistics show that wine tourists have a 16 percent higher income than the average tourist. “Having these people in our region spending money not only with our vendors, but also on hotels, restaurants, shops, attractions and activities in the area will have a big economic impact. We’re attracting new people that are planning their Lake George visit specifically for our festival, they’re staying longer and spending more money,” said Pardy. The SUNY Adirondack Foundation is the official beneficiary of the festival, receiving a portion of ticket sales from the event and they provide volunteers throughout the weekend. For more information, visit www.adirondackwineandfoodfestival.com.